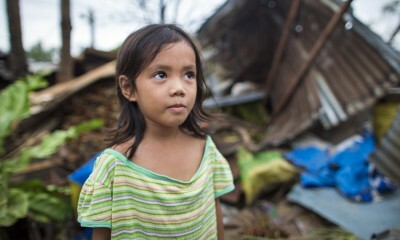 The true extent of the nightmarish damage inflicted on the people of the Philippines by Typhoon Haiyan became shockingly clear as the Samaritan’s Purse team traveled to hard-hit areas where we are beginning to help. Help Disaster Victims Around The WorldAs they approached, they began to see debris piled up higher and higher along the road. People stood in front of their destroyed homes—children, mothers, and families—crying out and holding signs: Need Help, We Are Hungry and Thirsty. 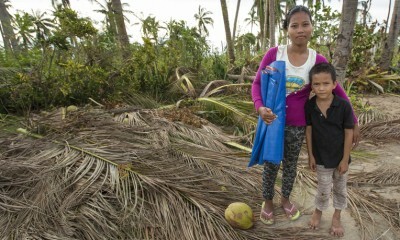 Hundreds of thousands of people lost their homes to the fury of the typhoon. It’s been just over a week since the deadly super typhoon—one of the most powerful ever recorded—slammed into the Philippines. The winds leveled tens of thousands of homes. In some places, tsunami-like storm surges swept up to one-mile inland, causing more destruction and loss of life. At least 580,000 people have been displaced. The days following the storm have revealed the true extent of the destruction. Samaritan’s Purse deployed disaster response specialists, including water and nutrition experts, to the region immediately after the storm. Our team is working in the Bogo City region, on the northern part of Cebu Island, and on Bantayan Island. We are distributing protective tarps, blankets, hygiene kits, and emergency family food packets, and installing community water filters. Samaritan’s Purse has begun to distributed supplies, including tarps for shelter, on Bantayan Island. Since arriving, we have been working with church partners and volunteers to prepare hygiene and family food kits. Four thousand emergency supply kits, containing food and hygiene items, have been distributed to families in northern Cebu and on Bantayan Island. 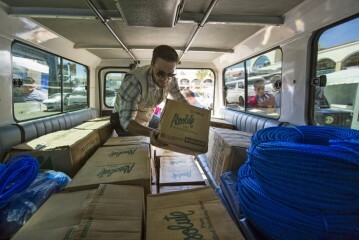 Another 4,000 kits are being assembled for distribution to families in affected areas. “We are trying to share the love of Christ and work with all the churches here,” Seger said. Food and hygiene parcels are on their way to help people who lost everything. On Wednesday, a team of Samaritan’s Purse staff, church pastors, and volunteers traveled to Bantayan Island to begin distributing the emergency supplies, including food parcels and tarps that can be used for shelter. 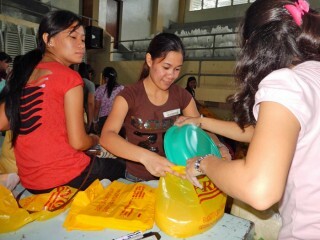 Filipino Christians help assemble food packets. More relief arrived on Sunday morning local time, when a cargo jet chartered by Samaritan’s Purse and filled with 110 tons of emergency supplies landed in Cebu City. The airlift included plastic sheeting for shelters, as well as community water filtration systems, thousands of blankets and mosquito nets, medical tents, medical supplies, and generators. Samaritan’s Purse also is working with health officials to see how we can meet critical medical needs. International Emergency Relief When natural disasters strike, Samaritan's Purse responds quickly to bring relief to people in need. One way we help in disaster situations is by handing out “family survival kits” that include warm blankets, buckets with water filters, cooking utensils, soap, and other daily essentials. For just $45, we can provide a lifeline to a family that has lost everything, to help them get back on their feet.